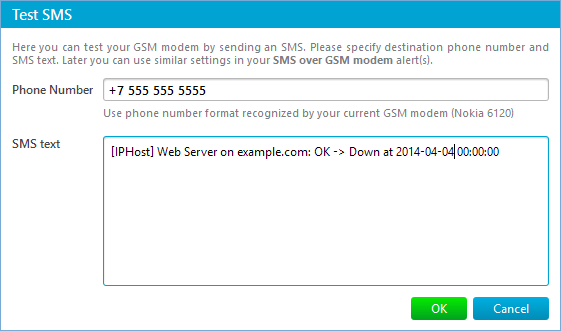 Here you can define GSM modems attached to the computer for use by the SMS over GSM modem alert. There can be two GSM modems configured. The secondary modem is used if sending a message via the primary one fails. Any of the modems may be enabled or disabled at any time if necessary. A GSM modem can be a dedicated device with a serial, USB or Bluetooth connection, or a mobile phone that provides GSM modem capabilities. 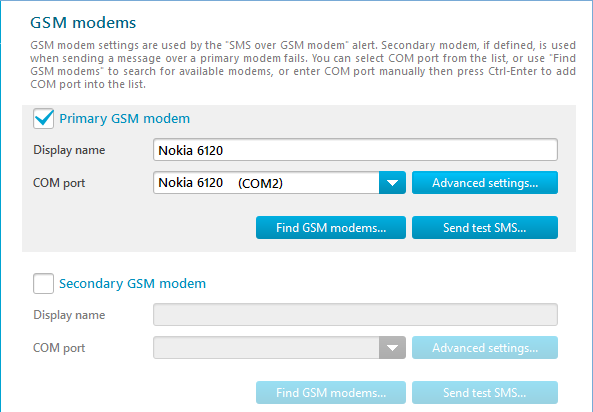 To perform these tasks, a GSM modem must support an “extended AT command set” for sending/receiving SMS messages, as defined in the ETSI GSM 07.05 and 3GPP TS 27.005 specifications. 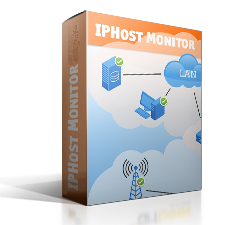 To use a GSM modem from IPHost Network Monitor you must first install a modem driver on your PC. Usually the modem driver can be found on the CD or disk that came with your mobile phone or on the Web site of the mobile phone manufacturer. If you cannot find the modem driver on the Web site, you can still use Windows’ standard modem driver. Display Name – is a modem name. COM port – is a serial port the modem uses. You can either select the modem/port combination known by Windows from the drop-down list or enter the COM port manually. Press Ctrl-Enter to add the manually entered port to the list. More options are available in the dialog box opened by the Advanced settings button. 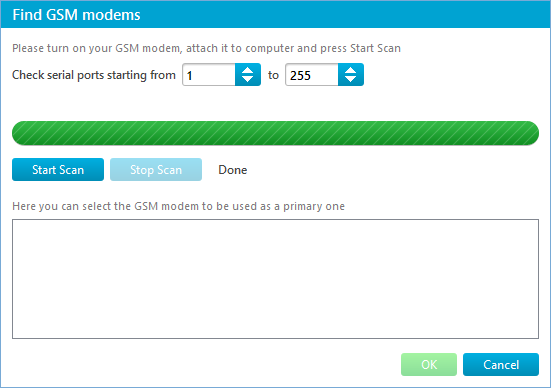 You can specify the modem’s custom initialization AT sequence; a non-default SMS center address; a baud rate to be used for the modem; whether a software handshake should be used; whether an SMS status report should be requested.